Knoxville, Tennesse is the last place you would normally think of when power-pop, punk-tinged music comes to mind. 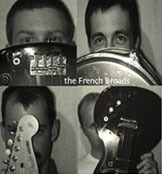 Aside from comparisons to Television (which the band does not mind), the French Broads are more diverse than a simple Television copy band. But, more importantly, they have the true SPIRIT of Television - straight forward, melodic power-pop. Content to "let the music do the talking", the French Broads have a no-rock-star-egos allowed attitude. They are no-nonsense, everyday "Joes" playing not so ordinary music! E.C. : In the French Broads I hear a lot of Television influence, but MY FRIEND SPEED is not son-of-MARQUEE MOON. For instance, the song "Forgotten" is definitely not a Television sounding song. Your songs aren't just re-write of other bands styles. Do you make a certain effort to emulate certain bands? Jim: We don't try to emulate other bands per se although many influences do seep through (we'll take a Television comparison anytime we can get one). Usually the opposite is true, if a song starts to sound too familiar we'll purposely throw in a "monkey wrench" and force the song somewhere unexplored. I like hearing albums with different types of songs and styles it feels more like a journey when listening rather than PRODUCT. E.C. : The CD didn't list songwriting credits, who writes for the band? Chris: Most of the of the songwriting and arranging credit goes to John and Jim (who we affectionately refer to as Patches). They will often return from a journey to the hinterlands with a song all baked up and ready to slice. I would write songs myself except for the fact that I have no talent for it, so I stick to hitting the kick on one and three, which is well within my capacities. E.C. : On your solo tape [John T. Baker "Little Rock Songs"] the songs have a different style, tone, etc. We're you trying for something different with the French Broads? John: It's not really a conscious thing. It's just the influence of other people (band mates). If left to my own devices, I guess I tend toward softer, more subtle tones and textures. With a full band, everybody Wants to get their jollies so the tone naturally tends to be harder and more rocky. We're each fighting for space. Plus, on my solo stuff, I'm doing everything myself and I'm kinda making the arrangement up as I go, building the recording layer by layer. So I really don't know how the songs are gonna come out until they're done. In the band, we've been rehearsing the songs to play them live, so the arrangements are usually pretty tight by the time we sit down to record them. E.C. : The band is relatively new, forming in 1999. What's the plan? Touring, another album soon? Jim: The band is now 2 years old we have been playing mostly local dates (and the occasional Enormo Dome gig) but are trying to set up some regional (e.g. Atlanta, Asheville, Nashville. etc) shows on weekends with other bands. Work on Album #2 has commenced already and due to an influx of new recording equipment will hopefully be even better sonically speaking. E.C. : Your web page is pretty sparse. Not in a bad way, a lot of bands go way overboard on their website in a kind of narcissistic way. Is this a reflection of letting the music speak for itself? Chris: I would love to be able to tell you that our minimalist approach to web site design was something we thought about and said, hey, lets be minimalists! The sad fact is that it has more to do with the general Sloth evident in the band, with respect to promotion. A side note is in order here. John randomly distributed these interview questions to us, but I find it a curious coincidence the he gave me the info necessary to edit our web site a few weeks back and I never did anything with it. Hmmm, what do you think? E.C. : This is a related question- you only have blurred pictures of the band on the CD and on the website, the individual members are hiding behind their instruments. Same reason? E.C. : What does MY FRIEND SPEED and its racecar connotation mean? Chris: I'm not sure? We actually all drive fairly tame vehicles, and speaking for myself I NEVER speed. E.C. : The last place I'd expect to hear a band of your quality is Knoxville, TN (I'm not knocking it, just surprised). Is there a cool scene there? Brian: I guess you could say there is a scene here, but it's pretty small. There are far too many Fridays and Saturdays when I check the paper to see who is playing and absolutely nothing in the listing for that night appeals to me. There is always somebody playing jazz and there is always some guy playing "Margaritaville", but sometimes it is kind of hard to find a solid, original rock/pop band. There are definitely several "high-quality" bands around, but sometimes we would like to see a few more. I guess it serves to keep us hungry for more, which is better than having a scene that is too saturated. At least when I do to go see a good local band, I usually leave feeling inspired. E.C. : You mentioned that your band has not done a lot of live shows. Is this also related to location? John: Yeah, Knoxville is a college town, which is a good thing for a band starting out. It's kinda like an incubator for bands. There's a constant influx of young people discovering new things and ideas and they're Ready to try out new directions. That's why the new "hot" scene is usually a smallish college town (Athens, Austin). The downside is that there are only so many places to play in a little town like Knoxville. If you play them all, which we've done, I think, it's easy to burn yourself out with the people who go see live music. We try to space the gigs out so that when we do play, people will at least be interested. But you have to balance that with the need to have a gig to practice for. If you don't have a show coming up, it's real easy to stagnate and get bored. For us, a show about every 6 weeks is right. E.C. : The inevitable touring question-when will I see you guys live here in Atlanta? John: Well, as a matter of fact, we have just lately been thinking that the next challenge for us as a band might be to do some short weekend outta town gigs. Atlanta is 3 hours away (only 45 minutes on the Lisa Marie). So could we come play at your house? Regarding touring beyond the one-off sorta thing I just mentioned, I've been in a full time touring band and I don't want to do it again. I tend toward self-destruction in that situation. I need to be at home. E.C. : Your press release says: "we don't take ourselves too seriously, we don't have long hair, we don't write angst filled cries for increased social conscience, and we're not particularly concerned with getting signed by a major label" Does this pretty much sum up the philosophy of the band? Brian: Yes, we are definitely laid back. We are serious about getting gigs and we are serious about recording, but we don't push ourselves real hard. We keep pretty busy, but it's probably because we are having fun. Fun seems to feed on itself. Sure, we get disappointed if we have a bad show, and we do get a little antsy if we go too long without playing for people, but I think it's probably for the right reasons. What is "angst" anyway? John: (responding to Brian) Brian, you're a lot of things, but laid back you're not. Sometimes I think if I poked you hard enough, you'd just explode. E.C. : You all must have day jobs, as you guys seem pretty grounded in reality. No matter how good a band is, luck is a major factor. The main mistake most bands make is thinking, "here we are, we don't need day jobs, where is the success?" What are your thoughts? Brian: I think the success is here. We all seem to be getting (or about to get) everything we want out of this. As long as there is a significant number of people coming to our shows and enjoying our recordings, I think we are all going to be pretty satisfied. At some point, every member of this band has been in a band that took itself too seriously. I suppose, in the past, a couple of us have even thought about "making it." We do have day jobs and stability. (I know "stability" isn't a very rock 'n' roll word). Fortunately we don't depend on music to make a living. Assuming any record companies might be interested, I don't think there are any that would offer us a better situation than what we have right now. I know this is a tired phrase but, "we have total creative freedom" as well as freedom to decide when we record and when we play live. E.C. : Although rock and roll began in the '50s, power-pop didn't emerge until the '60s-always making a return, no matter how many short-lived trends like grunge come about. What do YOU like about power-pop? Will it always be the "now and future" of rock and roll? John: There are so many things I like about pop music it's hard to list them... I like that pop music can assimilate so many styles of music. It can have elements of classical, jazz, country, salsa, anything. Plus I'm a sucker for melody and harmony. You don't find better melody and harmony than in a good pop song. I'll admit to being rather sappy about that too. Nothing melts my heart the way Brian Wilson can. I guess I'm basically an optimistic, relatively happy person and pop music best reflects my personality. And I gotta say, the folks I've met through pop music and the whole home-pop scene have been some of the nicest, coolest people I've ever met.